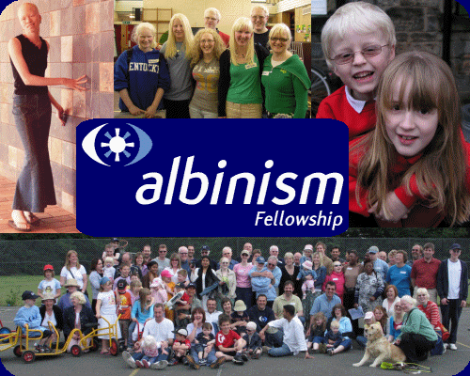 The Fellowship is a positive and sociable volunteer-run organisation that aims to provide information, advice and support for people with albinism and their families. We also provide information about the condition to professionals working with people with albinism, and other appropriate interested parties. Our focus is on the United Kingdom & Ireland, but we also work closely with other albinism support groups around the world. Albinism is a comparatively rare genetically inherited group of conditions which results in a reduction or complete lack of pigment (colour) in the skin, hair and eyes of people with the condition. This can result in pale skin which burns easily in the sun, virtually white hair, very severe short-sight and photophobia (a severe sensitivity to light). There are two types of albinism, that which affects the skin, hair and eyes (oculo-cutaneous albinism) and that which affects just the eyes (ocular-albinism). The most common type is oculo-cutaneous albinism. There are a number of distinct types of albinism which are associated with different genes The extent to which those who have albinism are affected depends on whether the body has any ability to produce the pigment melanin. The body produces melanin via a complex chemical process involving among other chemicals, an enzyme called Tyrosinase. For those who have oculo-cutaneous albinism some will produce a little of this enzyme and are known as Tyrosinase positive (Ty +ve) or OCA1B, but others will not be able to produce any and are known as Tyrosinase negative (Ty -ve) or OCA1A. People with Ty -ve are generally white haired and fair skinned, whereas Ty +ve tend to be a little darker with perhaps straw coloured hair and because of some pigmentation in the eyes, their eyesight is not so severely affected. The other main type is ocular albinism where the skin is normally pigmented but all the eye problems are present.